Prolonged unconsciousness—arbitrarily but sensibly defined as an undrugged comatose patient for at least 4 weeks after brain injury—is very. By this time, it is likely there have been conversations between clinicians and families regarding the degree of further life-sustaining treatment, and when appropriate and certain, care would have been witdrawn. How to go about that it difficult and requires expertise. 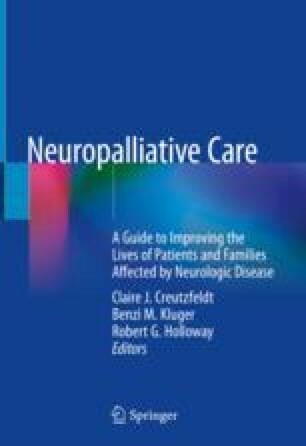 Neuropalliative care in patients with devastating acute brain injury—damaging the eloquent structures, which allow us to be aware, sapient and prospective—is multifaceted. Clinicians need to master diagnostic and prognostic skills including a recognition of later complications, which may cloud the clinical picture. At the same time, clinicians need to effectively and empathetically communicate changes in neurologic status (or lack thereof) and prognosis, and support families through a difficult decision-making process. This chapter will follow the clinical course of a patient and stop along the way to discuss the pertinent issues around prolonged unconsciousness in the ICU setting. The conditions discussed in this chapter are complementary to the acute presentation of severe acute brain injury described in Chap. 2 “Severe Acute Brain Injury”, and the chronic disorders of consciousness managed in neurorehabilitation centers and elsewhere and further elaborated upon in Chap. 4 “Chronic Disorders of Consciousness”. Herein, I discuss the critical decision making in the early days of facing a comatose patient with a catastrophic brain injury.